Texas Democratic Rep. Gene Green, the chair of the subcommittee investigating ethics charges against New York Democratic Rep. Charles Rangel, told CBS News Capitol Hill Producer Jill Jackson and other reporters Friday that the subcommittee is recommending that Rangel be reprimanded by the full House. "You know, it's so difficult when people have bad information for me to correct it," Rangel said, prompting a reporter to point out that the reprimand recommendation claim had come from the subcommittee chair. "It is so difficult when the statement is absolutely untrue," he said. 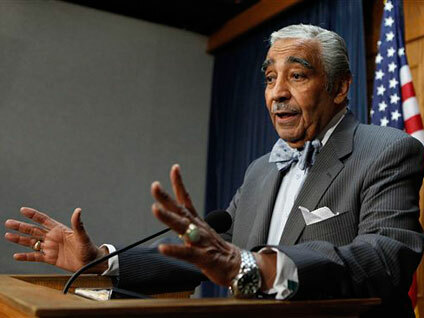 Asked why he would not accept a reprimand, Rangel said, "I'm saying your statement is untrue. It is untrue if they said that. That's just not so." *UPDATE: Rangel's Attorney Leslie Kiernan e-mails that Rangel "misspoke." "The appropriate sanction, including reprimand, was one of a number of issues addressed in settlement discussions," said Kiernan. The action now moves to the House Ethics adjudicatory subcommittee, which will decide whether to accept the investigatory subcommittee's recommendation or change it at the end of Rangel's trial -- unless a settlement is reached first. "If we could have reached a settlement we would have recommended that to the full committee...but that didn't happen," Green said. Asked if Rangel put a settlement on the table, Green replied, "At different times there were offers from both sides." He said there was never a vote on a proposed deal. If the recommendation is accepted and no settlement is reached, the full House would have to vote on whether to reprimand the longtime Harlem lawmaker. The House Ethics Committee brought 13 charges against Rangel yesterday -- Jackson lays them out here. Green also said some of the closed-door votes on bringing each of those 13 charges had not been unanimous. Reprimand - which is what Rep. Joe Wilson faced after his infamous "You Lie!" outburst - would be a relatively weak punishment for Rangel that lacks disciplinary action. It is a weaker rebuke then a censure, which could result in a member losing his or her chairmanships or seniority. The strongest possible action is expulsion, which requires a two-thirds vote by the House. The House has only expelled five members ever: three for disloyalty to the union during the Civil War, one (Rep. Michael Ozzie) as part of the ABSCAM scandal, and one (James Traficant) in 2002 after 10-count federal convictions for kickbacks, bribery and other violations.